For a franchise that has close to 20 games under its belt, one would assume that the latest entry might attempt to freshen things up a bit. Then again, if it ain’t broke?! WWE 2K19, as a result, is a pretty standard affair that gets everything right. The game, which was given to Vamers for review by 2K Sports, is a very polished instalment that has nothing new going for it. However, what it does have makes it the best wrestler in the ring. 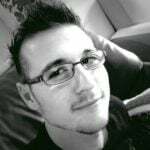 The game was developed by Yuke’s and Visual Concepts, two hard-hitting studios that often work on 2K Sports titles. This time around, the companies perfectly managed to capture the look and feel of a true-to-life professional game. One that comes with an excellent MyCareer mode, and a bunch of bells and whistles to boot. The biggest selling point this time around is most definitely MyCareer and MyPlayer. MyCareer is a single-player campaign where you first have to create your own wrestler via the MyPlayer interface. The career begins out as you might expect: an amateur wrestler is scouted by the bigger guys, gets signed, and then works their way up the ranks. Sort of. Pretty early on in MyCareer, your brand-new contract will reach a premature end thanks to some sabotaging by jealous opponents. It is from here on out that you will have to one again return to your amateur wrestling, and show the big-heads at WWE HQ that you are the real deal. MyCareer is a full-fledged story mode and it takes an epic leap forward in storytelling compared to previous entries in the series. 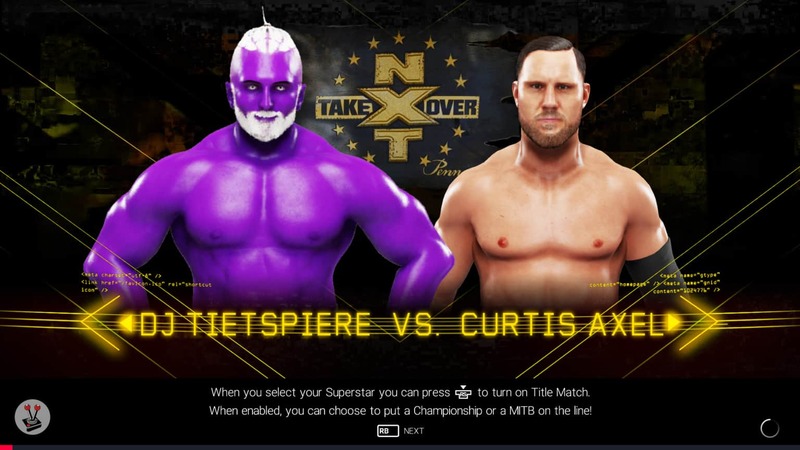 I created the most beautiful purple-skinned, white contact-lens-wearing wrestler called Edward “DJ Tietspiere” D. As soon as the first bit of the story is over, and you reach Chapter 3, your career skyrockets as you become one of the fictional BCW’s highest ranking wrestlers. Where people wondered about your wrestling ability at the start; you are now the agency’s strongest selling point. As you progress in the BCW, however, your wrestler will constantly go back to WWE HQ where he will ask the main man himself, Triple H, whether they can have their contract back. It is your life-long goal to be a WWE star, after all. My biggest complaint with MyCareer is that it takes a while to “get going”. It is filled to the brim with cutscenes and slow-paced dialogue. It is very much “real” in this regard, which is not a bad thing at all. Not being able to skip cutscenes or dialogue opportunities between key matches, however, may be frustrating to players who just want to get in on the action. With that said, cutscenes in WWE 2K19 are a spectacle to watch. Not only are they beautifully animated and rendered, but they also feature the main character predominantly throughout. This is very much a story about your athlete, and no one else. On that note, I must say that the MyCareer mode manages to get everything about wrestling correct: wrestlers are characters being played by professional fighters. Regardless of what anyone says, this is a fact. In MyCareer, you get to see the ins and outs of the wrestling world, all the way down to where wrestlers struggle with the directions their characters are going in. It was a truly eye-opening experience to see how cool Triple-H is behind the scenes, and how some wrestlers get along. You can also see glimpses of this when you check their Instagram profiles and listen to interviews. MyCareer is filled with tons of great cutscenes and moments where you interact with all of the various stars featured in the WWE. Another cool aspect of MyCareer is how likeable the main player character is. Whether male or female, your created wrestler comes from humble beginnings. At the start, they live in their father’s old exterminator van – something which is both a free living space and a means to remember where they come from. On top of that, the main character is also very humble and well mannered. Of course, you can diverge somewhat and create something of a reputation when the spotlight shines on you (using dialogue options), but at the end of the day, you are just a humble person trying to make it big in the wrestling world. 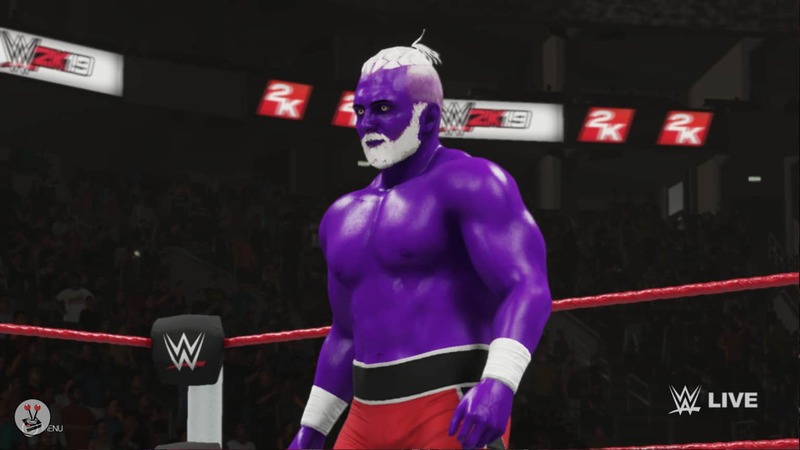 Perhaps the biggest feature in WWE 2K19 is MyPlayer. 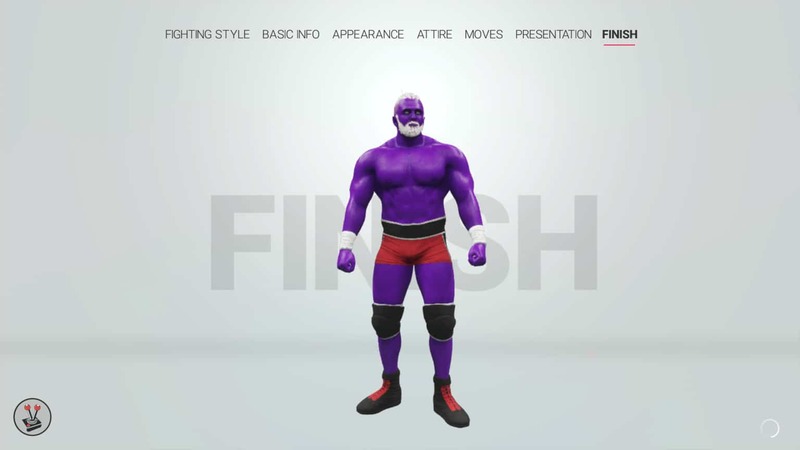 Here, you can customise your professional wrestler to your heart’s content. At the start of the game, you are given a lot of freedom in terms of presets and basic customisation to get the essence of your character down. After this, you can go back at any time to further finetune your wrestler’s looks and personality with things that you unlock as you level up. You can also unlock customisation options as you complete certain chapters in MyCareer. In a way, WWE 2K19 took a lot of pages from classic role-playing titles, and it is all the better for it. Another huge selling point is WWE 2K19’s Showcase Mode. Daniel Bryan first appeared in WWE 2K17 as a downloadable extra. This time around, however, he is back in the fully revamped Showcase Mode, which is the best way to experience the game and immerse yourself fully into all aspects of it. In Showcase Mode, you are met with cutscenes to the quality of the ones in MyCareer, highlights from Bryan’s days in Ring of Honor, as well as classic commentary featured in his earliest matches. It showcases Bryan’s career as a professional wrestler and allows players to go deep into his story, to see what makes him tick, and to directly take part in iconic matches from his career. Beyond MyCareer and Showcase Mode, the game offers a heck of a lot to keep you busy. Gameplay is generally the same as always – controls have not changed at all. However, the roster this time around is absolutely phenomenal! Over the course of all game modes, players will have a choice of more than 200 playable characters, not counting created characters. All these characters are spread across WWE 2K19’s Universe Mode. Universe Mode lets you take part in weekly episodes of the various WWE shows Raw, SmackDown, NXT, and 205 Live. Naturally, you can directly take part in the various matches (both online and off), but you can also tackle them from a manager’s perspective. In doing so, you can completely change certain aspects of shows like Raw, and even book certain star wrestlers for event matches and fights – to further your agenda of creating fictional rivalries or friendships. All of that aside, my favourite aspect of the game comes by way of filters, modes, and perks that you can toggle. These keep things interesting and silly, as it should be. A big favourite is Big Head mode, which naturally makes all character heads super big, making them look like Funko Pops or Bobble Heads. This is an especially hilarious mode. 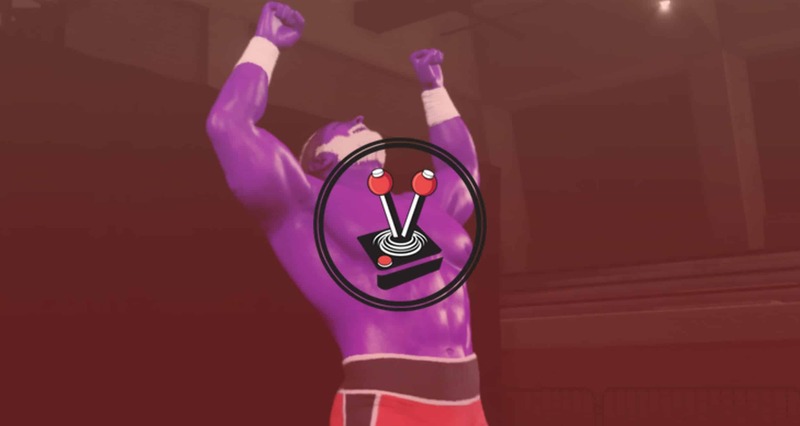 Other arcade features in WWE 2K19 include Playbacks and Overdrive, which let you play back past games, and fine-tune matches that allow you to balance them to what you think feels good. There are also perks that allow you to have instant finishers or to make you a tiny bit faster. My only nitpick is that I never felt that the controls were introduced to me in a nice, easy to understand manner. As you progress through MyCareer, you will be taught about different aspects of the wrestling world as your created wrestler experiences them. However, the short bursts of information on the screen never really resulted in knowledge passed down adequately. As such, I found myself doing practice fights and spending an extended amount of time in random Universe matches just to learn my character’s moves. Fortunately, it was easy to learn for me, as I come from a background of fighting games where individual movements are important to learn. Style and performance is a key aspect of any WWE title. WWE 2K19 hits the nail right on the head. 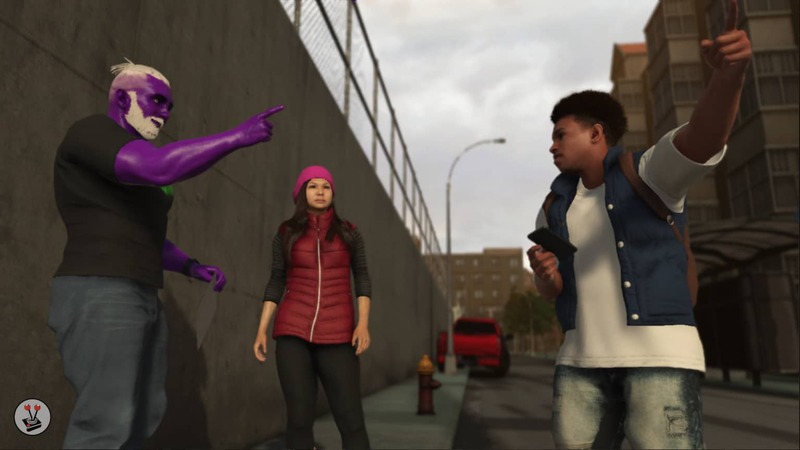 The game enjoys a hyper-realistic aesthetic where character models are scanned and tuned to be as close to real-life as possible. Similarly, characters move and animate exactly how they would in real life. Facial nuances are also captured intricately and then modelled and textured so well-known WWE stars can stare you down in the game pretty much exactly as they would in real life. Yes, real-life. 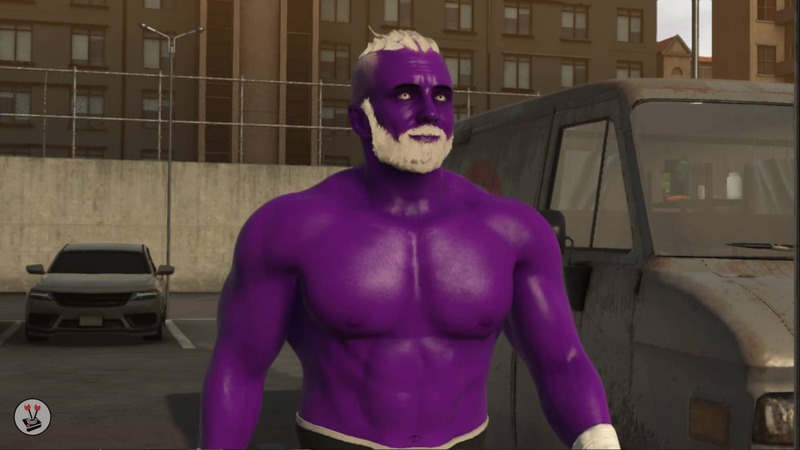 The game is pretty much real-life WWE simulator 2019. On top of that, characters also have entrances and victory animations that are pulled straight from the franchise’s vast profile of shows and exhibitions. The developers really went all-in when it came to the looks this time around. However, that is not where they stopped. The game is so true to life this time, that the entire soundtrack consists out of songs chosen by the stars themselves, and that true to life mantra also extends to how accurate the physics are in this game. This is not a game where the character jumps, flies or shoots ki-blasts at each other. Rather, it grounds itself in showbiz. You know, where throwing a chair at someone for hitting them over the head with a fold-up table gets an entire crowd to cheer. The best part is that it is all rendered in real time, and output at 60 frames per second – or as close to that as possible. The game renders at 4K for PlayStation 4 Pro and Xbox One X, and 1080p on the other console variants, and still attempts to hold as close to 60 frames as possible. This is crazy, considering the hyper-realistic detail it features. Lastly, I have to mention that I know how past games were riddled with bugs and graphical goofs. That is not the case this time around with WWE 2K19. In all my time with the game, I have not experienced a single bug. It runs as beautifully as Dwayne ‘The Rock’ Johnson’s oiled-up body and performs amicably throughout. Twenty-years in and WWE still has a lot going for it. Not only is 2018 one of WWE most popular years, but the franchise has also hit a new high with its titular game. WWE 2K19 may not bring anything extraordinary to the table, but what it does bring, is more than enough for any wrestling fan to enjoy. Thanks to a heavy emphasis on storytelling and graphical fidelity, WWE 2K19 manages to capture the exact look and feel of real-life WWE – as if you are playing real matches. It looks great, runs well, has a whopping character roster, and even lets you create your own very likeable character. There really is very little not to like. Twenty-years in and WWE still has a lot going for it. Not only is 2018 one of WWE most popular years, but the franchise has also hit a new high with its titular game. 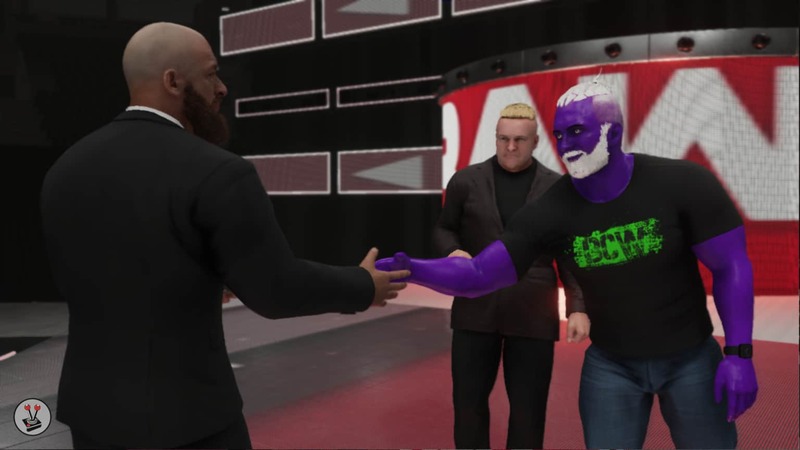 WWE 2K19 may not bring anything extraordinary to the table, but what it does bring, is more than enough for any wrestling fan to enjoy. Thanks to a heavy emphasis on storytelling and graphical fidelity, WWE 2K19 manages to capture the exact look and feel of real-life WWE - as if you are playing real matches. It looks great, runs well, has a whopping character roster, and even lets you create your own very likeable character. There really is very little not to like.